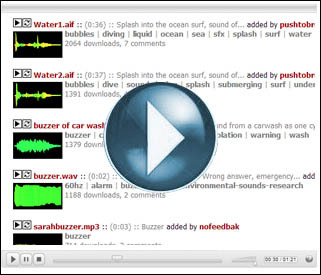 Quick overview: The FreeSound website contains thousands of pre-recorded sound effect files that can be used within your SMART Notebook presentations. A free account signup is required to download files from the site. How can it be used in the classroom? The FreeSound website (www.freesound.org) allows you to search for sound effects of animals, nature, household noises, ambiance, vehicles… pretty much whatever you can think of! These sounds can then be used with the SMART Notebook software so that if your student taps on an image or word, they will hear a specific sound effect played back. These sound effect files could also be used with other ICT applications too. Great for language classes! Copyrights: Please note that the sounds on the site are freely available for download under a Creative Commons license, which you should quickly consult before you start using these sounds in your classroom. (Don’t worry, it’s not a long read!). Important note: If you’d like to know how to insert these sounds into your SMART Notebook presentations, please refer to my earlier ICT Blog posting on “Inserting pre-recorded sounds into your SMART Notebook presentations“. This entry was posted in IWB and tagged effects, freesfx, fx, sfx, sounds, soundsnap. Bookmark the permalink. « ICT Tip: Information for students that clearly outlines their rights and responsibilities as Quebec citizens. Great for Learning Situations!